I like books. I really like books. I seem constitutionally unable read only one thing at a time. This filters down to the kids, too. We’re reading some great stuff right now, so I thought I’d share. 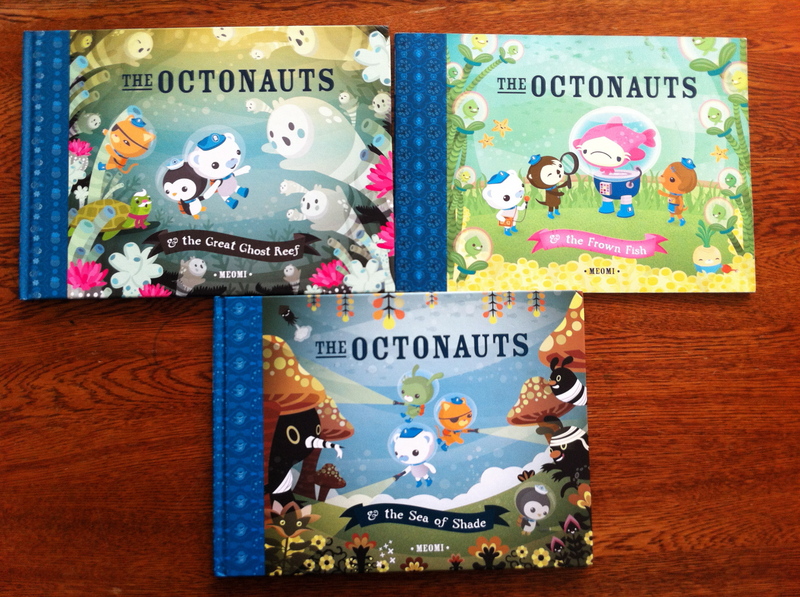 She is in love with the Octonauts, a series of books and cartoons that we discovered thanks to the BBC in Wales. We read these several times every day (saints preserve me). The art is great, the characters are adorable, and, when watching the cartoons, she learns stuff about marine life and the oceans. My daughter is so obsessed that she insists she is neither boy nor girl, but penguin – Peso Penguin, the medic character. I am called almost exclusively Tweak Bunny, the engineer – no more Mama here! Next, my 5-year-old. 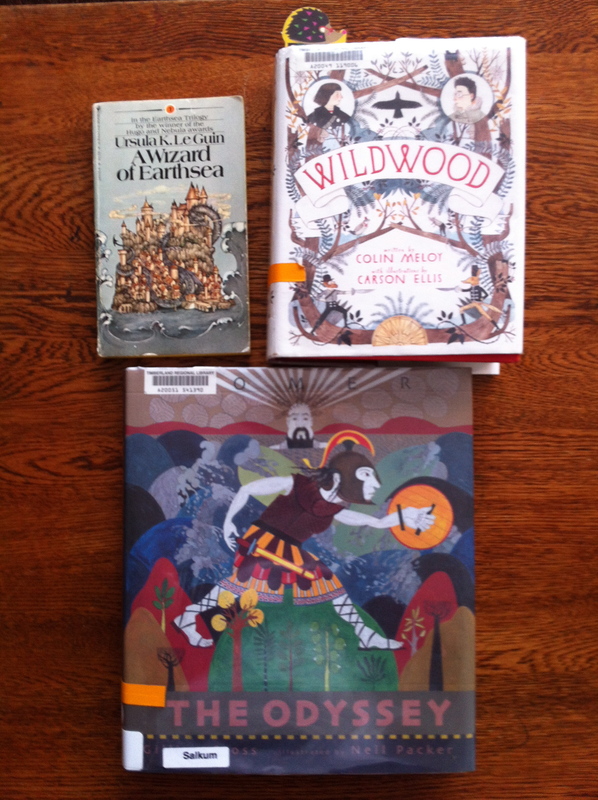 Together we are reading the following: A Wizard of Earth Sea by Ursula K LeGuin, Wildwood by Colin Meloy (he of the Decembrists), and The Odyssey as retold by Gillian Cross and illustrated by Neil Packer. These are unintentionally listed in order of least to greatest preference. LeGuin is marvelous, but rather dense and staid for a 5-year-old. Son still enjoys it, but he asks for the others first. Wildwood, an alternate reality book set in Portland, OR, is good, but not great. Son really likes it, and middle school readers might love it. As a more advanced reader there are some flaws that I think better editing could have helped, and also could have slimmed down this hefty tome by about a third. Meloy says in 10 words what could easily be said in 5. Here is what I’m reading. The first is my one novel, Victor Hugo’s French classic, The Hunchback of Notre Dame. I’ve never read it. I have a love of 19th century and gothic novels, and Hugo’s other great novel, Les Miserables, is one of my all time favorites. This book, however, is rather slow going, both because I have limited time to get engrossed in a book like this (one with such complex writing and long-winded descriptions that uninterrupted chunks of time are necessary for true enjoyment) and because, well, it’s a little dull so far. Second is Living Your Yoga, by Judith Lasseter. One of my yoga teachers recommended it, and I quite like it. It’s a little book on how to bring the values of yoga into your every day life. I’m reading one chapter a day and using it as a bit of focus. Today, for example, is about Control, about letting go of our need for it, and how this affects not just our asana practice but also our relationships. Yesterday was Compassion, etc. The next two are both Scarlet Imprint books. The olive colored one is their latest, Serpent Songs, a collection of essays on Traditional Witchcraft. I’m only half way through. I am struggling with some of the essays. I may write a longer review when I finally finish. 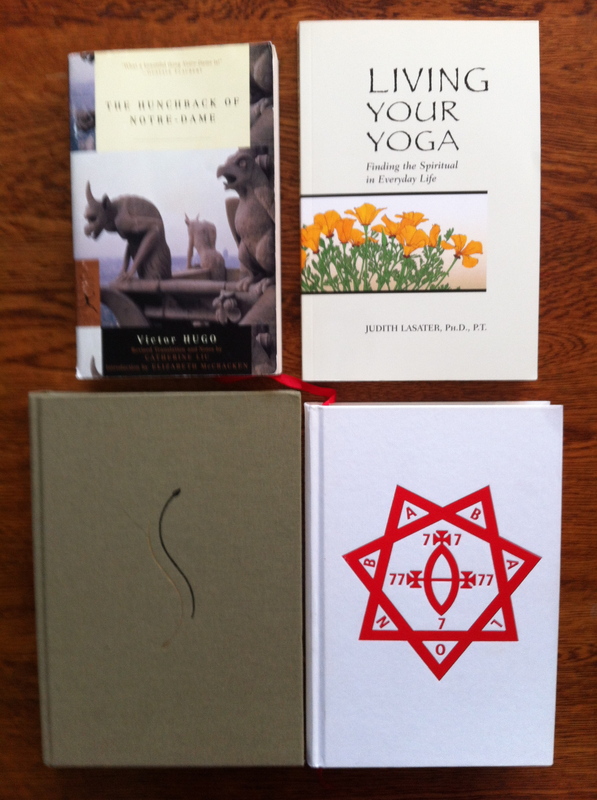 The white book is Peter Grey’s The Red Goddess. I’ve read this one before (twice), but I am reading it again! I love this book, even though it is highly problematic, particularly to anyone with a strong biblical studies background. And yet, I still think it is worth reading. What are you reading? Anything you recommend? This entry was posted in Uncategorized and tagged books, family life, myth, witchcraft, yoga. Bookmark the permalink. I’m reading Music Theory for Computer Musicians and Complete Works of Aristotle Volume 1. The music theory book is pretty obvious for me but Aristotle was something I just grabbed off the shelf and started reading to decompress from editing last few weeks. The guy was a genius. Every word of his work is amazing, as completely backwards as some of the science is (by today’s standards). He tried so earnestly to understand everything, and did a pretty good job of it! The sheer volume of his writings is totally inspiring, while so completely different from his mentor Plato. I sway between the two constantly. All of Western philosophy stems from their work and it’s all great reading. You are SUCH a Renaissance man! I love it! I have very limited Greek philosophy under my belt. All I’ve read has been in relation to Christian theology. One of these days I’ll go back and re-educate myself. I think the relationship between Plato and Aristotle and the development Christianity is fascinating. Both were used to justify the cause in different ways. When science started to modernize and they pulled away from the church, Aristotle especially got the short end of the stick. Many of his conceptions of science were considered quaint and with the religious baggage it dragged behind it from the middle ages, the respect for the work plummeted. Ironically, staunch atheists of the 20th century like Ayn Rand cite Aristotle as major influences of their philosophical ideas- which is also not much of an endorsement for his work. Regardless- yes! The Ancient Greek thinkers are worth your time! I’m reading ‘Basilica’, by R.A. Scott, a pop history of the building of St Peter’s in Rome. I started the book on the recommendation of a historian friend in an effort to prepare myself for an upcoming visit to Rome (where I’ve never been), but I’ve become caught up in the artistic, religious, and political grandeur of the High Renaissance and the Baroque. Like you, Niki, my non-fiction reading — until now — has been circumscribed by the requirements of academic pursuits. I know more than anybody needs to know about Imperial Rome and Late Antiquity — and British history from the Normans to the Hanovers — but the Italian 16th century has, up to now, been a kind of vague blur of popes and painters. Not any more! For more contemporary fare, I’m looking forward to Thomas Pynchon’s new book, ‘Bleeding Edge’. Due on Sept 17, I’ve already pre-purchased it on Kindle. Pynchon’s most recent, ‘Inherent Vice’, is delightful, and a movie is apparently in the works. I enjoyed ‘Against the Day’ far more the 2nd time through. Those new to this American writer of surprisingly dense and complex novels are encouraged to start with his masterpiece, ‘Gravity’s Rainbow’ (1973). ‘Gravity’s Rainbow’ can be thought of as a kind of enthusiastic precursor to the new trend in speculative fiction toward ‘fiction about science’ — in contrast to ‘science fiction’. The novels of Kim Stanley Robinson and Neal Stephenson are excellent exemplars. I’m also reading Michael Chabon: ‘Kavalier & Clay’ and ‘Telegraph Avenue’. In light of current events in the Middle East, everybody needs to run right out and read his ‘The Yiddish Policeman’s Union’. Read it right to the end. We are huge Chabon fans in this house, particularly Adam! I loved Cloud Atlas, but haven’t seen the movie. Have you read ‘Gould’s Book of Fish’ by Flannagan? You would likely enjoy that too! I’m currently making my way through Ermakov’s Bø & Bön: Ancient Shamanic Traditions of Siberia and Tibet in their relation to the Teachings of a Central Asian Buddha. Kathmandu: Vajra Publications, 2008; and Moke Kupihea’s The Cry of the Huna: The Ancestral Voices of Hawai’i. Rochester, VT: Inner Traditions, 2005. The former is a detailed study of Circum-Polar shamanic traditions and one reflex, the Tibetan Yung-drung Bön. The latter seems more a creative pastiche, and is really waiting until I finish Ermakov. My preference is really well written scholarly prose, though I’ll admit that poetry (by its very nature not something that can be skimmed) holds allure for me. Those books sound great! You might be interested to know that there is an essay in Serpent Songs on Trolldom by Johannes Gardback. Did you read that essay? What did you think? I did read it and I liked it! I liked the tone and the practicality. I also didn’t understand much of it – and not because of bad writing! Because it was technical and really place/culture intensive. It was confusing to me in a good way! I would love to know your opinion on it. Do you own it? Perhaps when we come down on Saturday, I can take a glance for a bit.